Welcome New Readers! 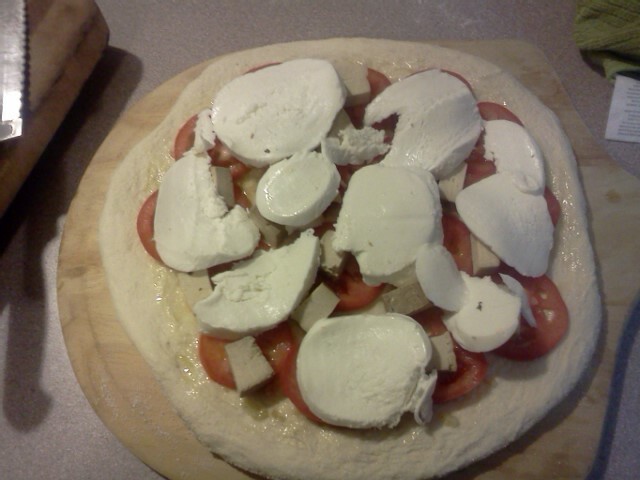 A Caprese Pizza! Home› News › Welcome New Readers! 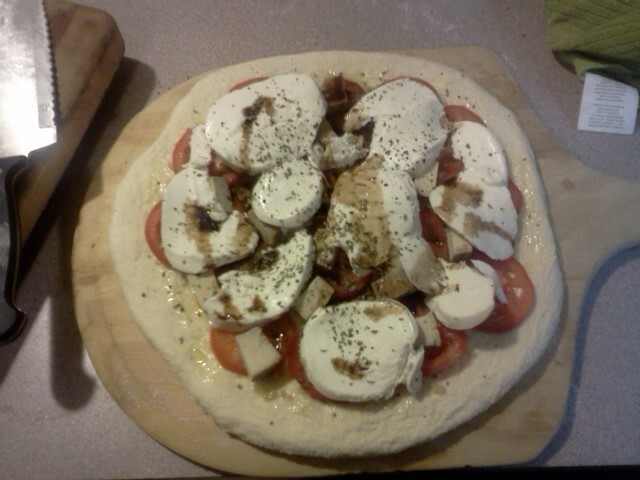 A Caprese Pizza! Hello to all my new readers! The amount of readers has greatly increased over the past few weeks so before I get started on today’s post, I want to re-introduce myself. My name is Aaron and I am the owner/operator of The Super Sweet Shirt Co. which is an online T-shirt and Baby Clothes company that I run here in Buffalo, NY. You can see my things at supersweetshirts.com. I don’t use this blog to promote products, unless I’m doing a demo on the creative process for a new design. I mainly write beer reviews, wine reviews, restaurant reviews for Buffalo and other cities that I travel to, recipes for things that I cook, and home repair projects. This Monday we will be closing on our house so there will be plenty of things to write about and things that I can share. So if any of these things interest you, bookmark this page. 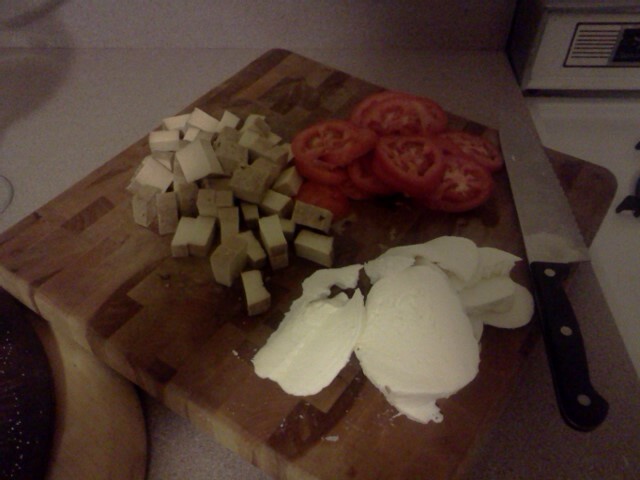 Let’s get started with tonight’s dinner: “Caprese Tofu Pizza”. Sprinkle some corn meal onto your surface. 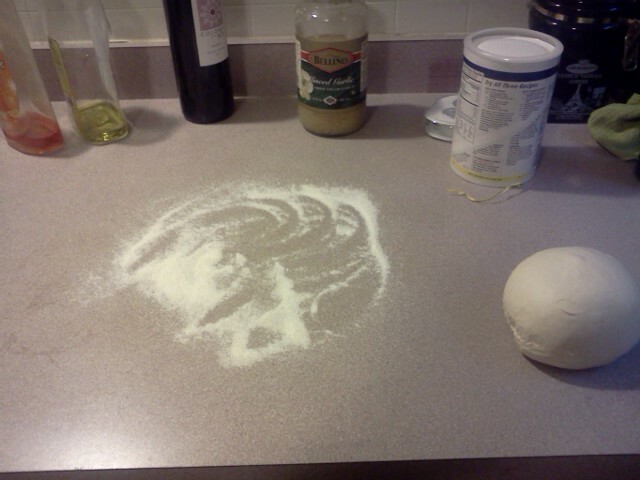 Take your dough that you have and depending on how large it comes in size, cut it accordingly. If the dough sticks to your surface, then use more corn meal, it should not stick or become difficult to work with on your surface. Here in Buffalo, Wegmans has amazing pizza dough but each package comes with a large quantity, so for this pizza I cut it in half. With any dough, you want to roll it, whether in your hand or with a pin. This squeezes out any air bubbles in the dough so that you won’t have any undesirable, gigantic bubbles on your pizza while its in the oven. 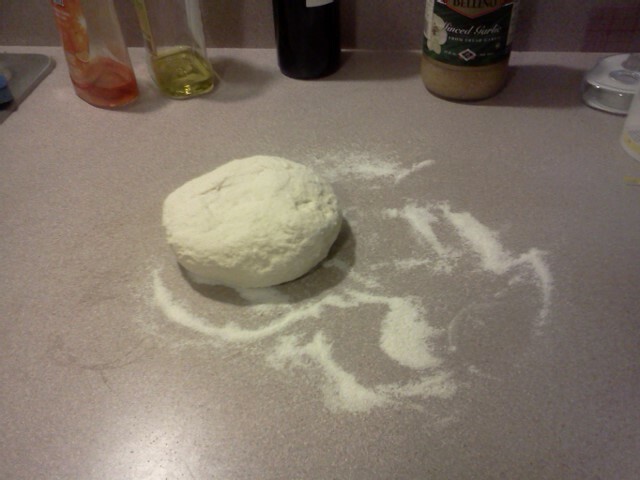 After you get the air out of the dough, you want to pound it out. If you don’t have a pizza background, you can use a rolling pin. 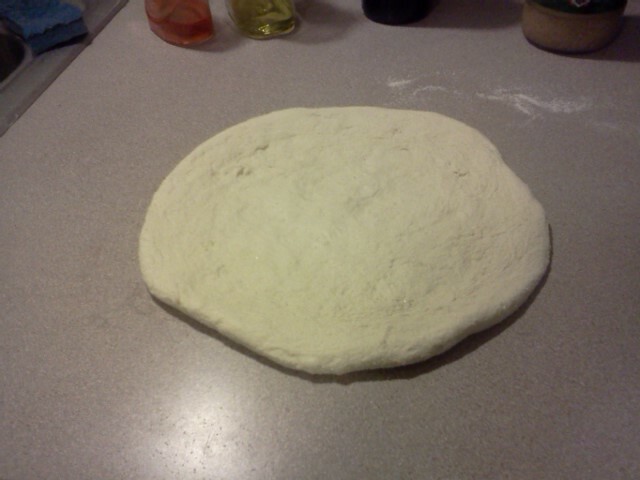 After you pound your dough out, preheat the oven, with the stone in it, at 475 degrees. We want to get that stone hot so that the bottom of the pizza gets nice and stiff. That way we don’t have a soggy pizza. Pizzas with a decent amount of tomatoes or with greasy things like pepperoni can create a lot of liquid while cooking and if the pizza doesn’t stiffen up, it will get sloppy. Transfer your dough that you pounded out onto your pizza spatula, or something else that you can easily transfer a pizza with ingredients on it. You’ll slide this onto the stone after the ingredients have been put into place. Make sure you have a generous amount of corn meal on the spatula especially if your pizza is going to be heavy. 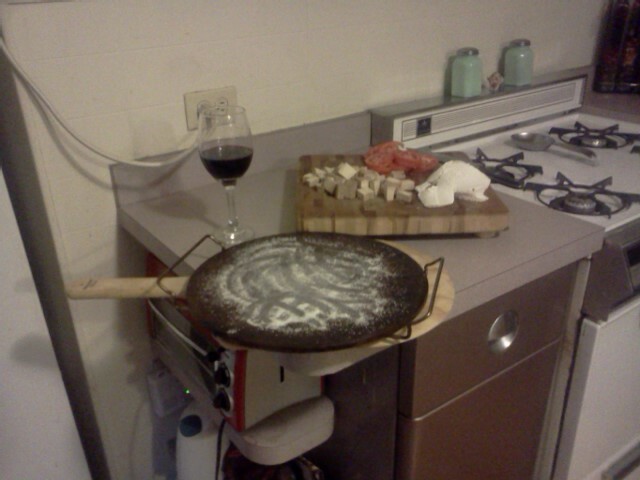 This will allow the pizza to slide off the spatula and onto the stone without sticking. This takes some practice so if its your first time, use a lot of corn meal. After you corn meal your spatula, place your dough on it and spread olive oil over the top until it is coated nicely. 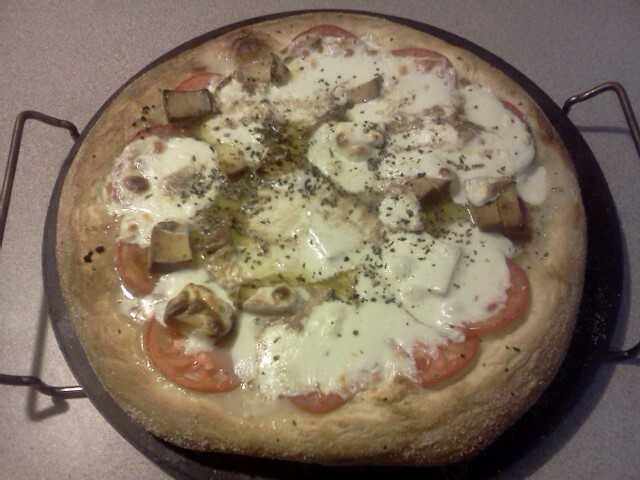 Make sure you leave a ring around the pizza that doesn’t have olive oil on it which would be your crust. Sprinkle minced garlic all over the oiled area. The amount is up to you, we love garlic so we went heavy. I didn’t put a specific amount for any of the ingredients because I believe that it should be up to the person cooking and what they would prefer. 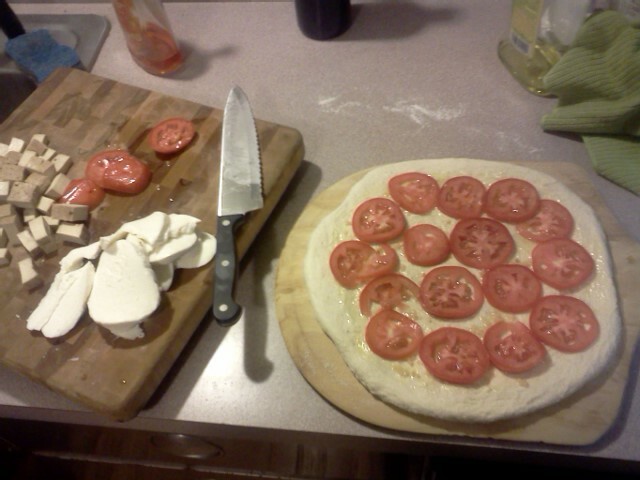 Take your Roma tomatoes, slice them up, and place them around the pizza until the entire area is covered. The next part is clearly optional. My girlfriend was in the mood for a little more substance when we were making this so we added cubed pieces of precooked tofu. We then covered the pizza with fresh slices of mozzarella cheese, a sprinkle of ground pepper, some basil, and a drizzle of Balsamic Vinegar. Take your pizza and slide it onto the stone in the oven, close the door, and lower the temp to 450 degrees. The pizza will take about 10 minutes to cook. You can tell when its done when the cheese is nice and melted and the crust is a golden brown. Remember, you don’t want to use too much dough at the temperature we are cooking at or else the pizza will look done, but the dough will be “doughy” on the inside. Enjoy! Check back tomorrow for a review of Saigon Bangkok on Elmwood Ave in Buffalo NY, a Vietnamese/Thai restaurant that has been around for a while but have never had a chance to get to until this weekend. Also check out below as I captured a video of the party scene at our grocery store. If you are not familiar with Wegmans, it is unlike any grocery store in the world. The one near us jams out ridiculous music in the cafe portion of the store. The guys behind Nicole were having a blast during lunch! Cheers!